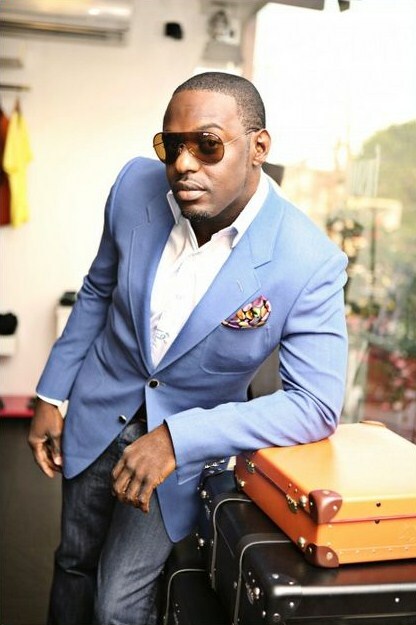 A social media user identified as Egor Efiok has taken to Facebook to urge Nigerians to boycott the new cab hailing system Mr Taxi over what she considered as an alleged usage and dumping of Nigerian actor Jim Iyke. Egor Efiok believed that the company rode on the popularity of the actor to publicize the App before claiming that he wanted a share in the company and was parading himself as the CEO. This Mr Taxi App Austin is a big MUMU and I urge all Nigerians to boycott his service and use Ubi Franklin’s own, Taxify or Uber instead. After using Jim Iyke’s name and brand to garner publicity, he is now calling Jim Iyke out as an impostor. In the same breath, he also quips, “Jim Iyke is my friend”. With friends like him, who needs enemies? If it weren’t for Jim Iyke, I would never have heard of Mr Taxi App. He now claims that Jim was only hired as a brand ambassador and then started asking to be a shareholder. So what if he asked to be a shareholder? Is he not a businessman? Jim has several other businesses and does not need his ponkious Mr Taxi App. He was only helping out a friend and now this is the thanks he gets in return. It is just the same way a filmmaker decides to front Idris Elba or any other big celebrity as producer because they know that these celebrities would pull massive crowd and returns. I am certain that this is what this ingrate of a man agreed with Jim and then suddenly became jealous, as Jim stole the show. He is not a proper businessman and just shot himself in the foot. If celebrities refuse to help people, they will be labelled as snobs etc…would you blame them after encountering ingrates like this Austin man? 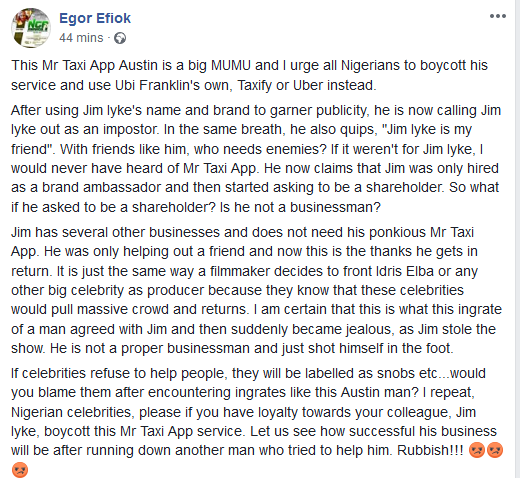 I repeat, Nigerian celebrities, please if you have loyalty towards your colleague, Jim Iyke, boycott this Mr Taxi App service. Let us see how successful his business will be after running down another man who tried to help him. Rubbish!!! Posted by Mr. Cis on October 9, 2018.